While some larger GuitArchitecture posts are in the pipeline, I wanted to post about a few online tools I use frequently when practicing that may be helpful to you as well. In previous practice posts, I talked about keeping a practice log and using small increments of time (5-10 minutes) in multiple sessions to really focus on ideas. (You can download a sample log here or here). The tools I mentioned to assist in this are a metronome and a stop watch. Not to be confused with the very cool sevenstring.org forum, Seventh string is the company that produces the excellent Transcribe! software. While Transcribe! isn’t free (nor should it be – it’s an excellent piece of software that will pay for itself many times over) they have a number of useful free apps on their utilities page that may be of interest to you. The apps all use Java so you’ll need to have that installed if they’re not working – but the great thing about each of these apps is that they can either be run online or downloaded to your computer to run if you’re somewhere without an internet connection. Getting in tune is the first step to any practice session. The online tuner on seventh string is functional but I find the tuning fork to be a lot more useful. In addition to providing tones to tune to, the tuning fork also can act as a drone. Drones can be a great tool for developing melodic ideas in a harmonic context. The real prize here though is the metronome. I love the old school graphic and the click sound isn’t annoying to me. It also has tap tempo and can move incrementally. Working hand in hand with the metronome for timed training is a stop watch. I’ve plenty of hardware versions that are fine. But I really like the numerous variations on the online-stopwatch site. The countdown version is perfect for setting 5-10 minute increments (or longer) and rings when it’s done. There’s a metronome on this site as well – but it doesn’t allow incremental movement. When practicing mid day – I tend to just open up my log, tune up, set the countdown timer turn on the metronome and work on the first thing on the log list. The simpler you make a routine – the easier it is to maintain. Anyways, nothing Earth shattering here – but I hope it helps! What’s wrong with playing “Flight of the Bumblebee” for a world speed record? I have linked two sample documents for logs below. You could use word or excel, or any basic word processing or spreadsheet application to generate one of these. I haven’t seen an online version of these I like – So I’ll stick with these for now. I’d like to start this brief series off with an explanation of how I view the function of theory. “Theory is secondary to sound. The history of music originates in organized sound. Theory and jargon were developed over time as a way to replicate those organized sounds. When a term like “C major” is used, it tells the informed person what kind of sound is going to be produced. This jargon then, is nothing more than a way for musicians to express ideas to each other without written music in a more efficient manner. This series of lessons are excerpts from the Guitarchitect’s Guide to Modes: Major Harmony book (due out in 2012). While that book covers basic intervals and chord theory, this lesson will make the most sense if you have some knowledge about chords, intervals and chord construction. Having said that, even if you have a very limited knowledge of these areas you can still get something from this lesson by playing through the examples. When I was at Berklee, one of the recommendations I got was to learn a minimum of two voicings for every chord type I came across (and more if possible). While this is certainly a valid point – another way to approach learning new voicings is to reconceptualize what you already know. To see other ways of looking at things in this case, I’ll need to bring in a little music theory/analysis. When is C, E and G something other than C Major? In order to identify a chord, we first have to establish the root to determine the functions of the other notes in the chord. For example, if we look at the notes C, E, and G with C in the bass we get a C Major chord. However if E is the root of the chord – it’s possible that the chord could be analyzed as an E minor with an added flat 6th and no 5th. While you may hear this combination of notes as come kind of E minor chord, you are more likely to hear it as a C major triad with E in the bass. The sound of a major triad is so entrenched in the average listener ’s head that it will be very difficult to hear this specific combination of notes as anything other than C major. This is sometimes written as C/E. 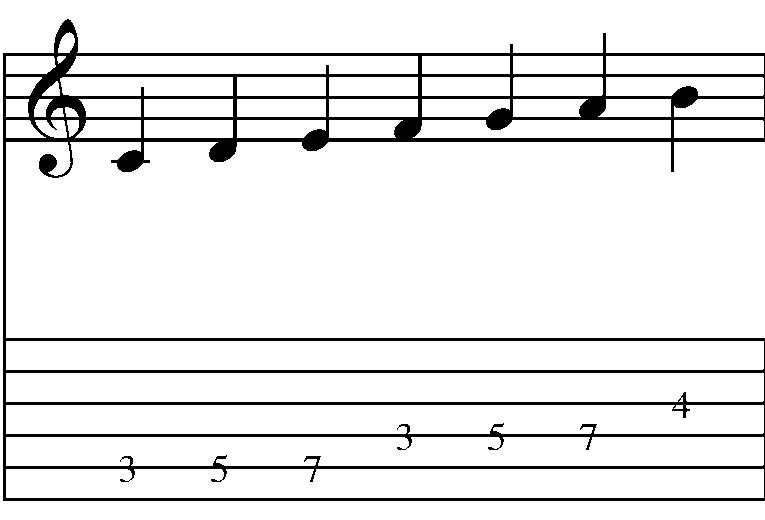 This chordal notation is commonly called a slash chord and is written in the format of chord/bass note. The same is true for the next example. 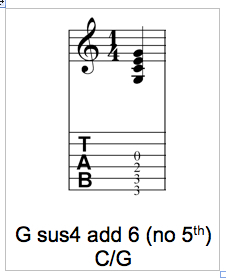 If G is the root of the chord – the chord could be analyzed as a G sus4 add 6 (no 5). But more likely you will hear it as C/G. Let’s add a note outside of the triad to the chord. By putting an A in the bass, the chord spelling is now A-C-E-G (which is an A minor 7th chord). Just because you have 3 notes doesn’t mean that you’re limited to a specific chord type. In other words the notes C, E, and G are sometimes more than a C Major chord. 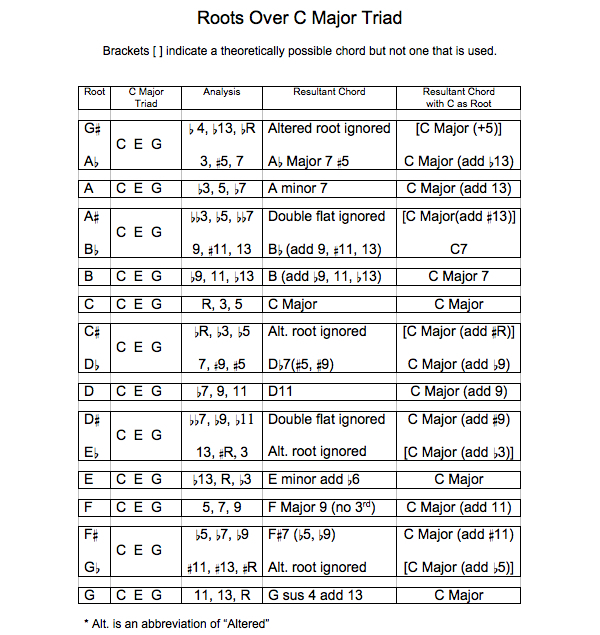 Let’s now look at how a C Major triad can be analyzed over every other root. A quick theory tip: Whenever I see chord or a scale that I’m having trouble recognizing, I recommend modulating it to the key of C. The reason for this is the lack of sharps or flats make any accidentals immediately identifiable. 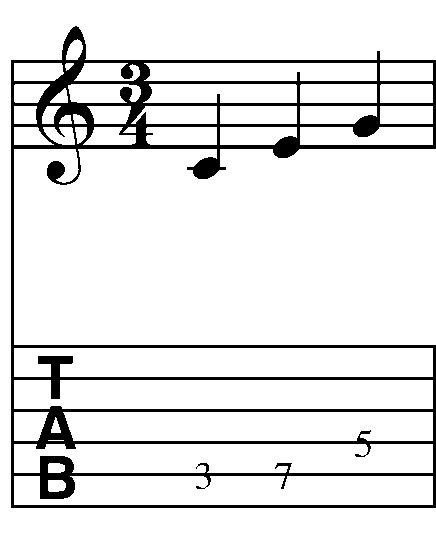 There are several ways that these chords could be interpreted and that this is merely my analysis. The Analysis column is analysis in relation to the root. 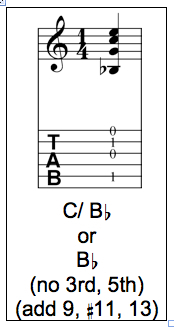 For example, the C of a C major triad is a b4 over a G# root. The resultant chord column has an implied analysis. 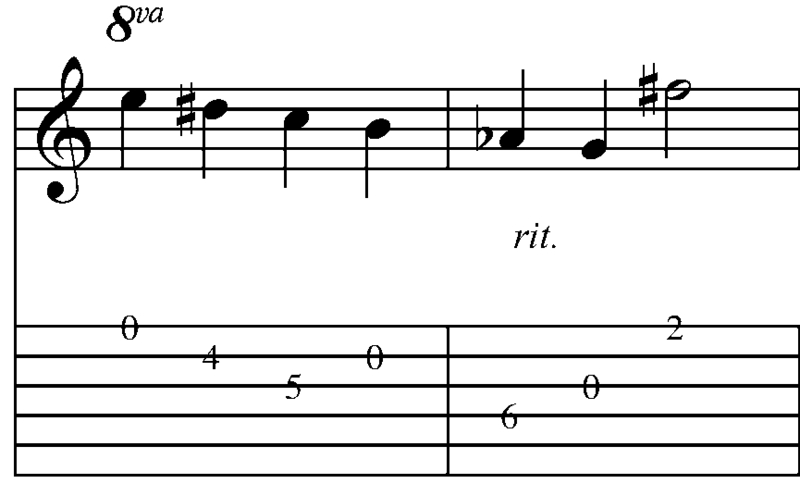 For example the D11 derived from a C major triad over D is more accurately a D11 (no 3rd, no 5th add 9). Some of the voicings presented are theoretical voicings and not something you find on a chord chart. For example: C7 is a much easier voicing to conceptualize than C Major (add #13) and I have yet to see a chord chart with C Major (add #13) on it.) Ditto for altered roots. Let’s say I’m playing a song that uses a major chord and I want to spice it up. 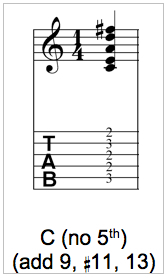 In looking at the above chart, I see that utilizing a C major triad over a Bb could be seen as a C7 chord with the 7 in the bass (C/ Bb ) or it could be seen as a Bb chord with every upper chord tension. Here’s a voicing in open position. Now let’s make this a movable voicing. and we get a really rich sounding substitution for a C major chord. This chord merely scratches the surface of this approach. In addition to making some new chords from familiar voicings (i.e. Ab maj7#5 = C major /Ab), you also get some improvisational approaches as well (for example – as a starting point for soloing over a Ab maj7#5 you could play a C major arpeggio rather than learning a maj7#5 arpeggio). For now, I would recommend exploring these sounds both as chords and as an arpeggio approach (i.e playing a C major arpeggio over each root) to see what sounds work for you and then adapt those to other keys. Additionally, this process can be applied to any chord. If you feel like exploring this approach – C minor might be a good place to start. In part II of this series, I’ll discuss a process I call triadic transformation as another way to reconceptualize chords that you already know. In the meantime, just remember that there isn’t anything here to get too hung up about. Take the sounds and approaches that work for you and discard the rest. I hope this helps! You’re free to download and distribute any of the lessons here but I maintain the copyright on the material. I’m always looking for feedback, so if you have any questions or comments, please feel free to e-mail me at guitar.blueprint@gmail.com. 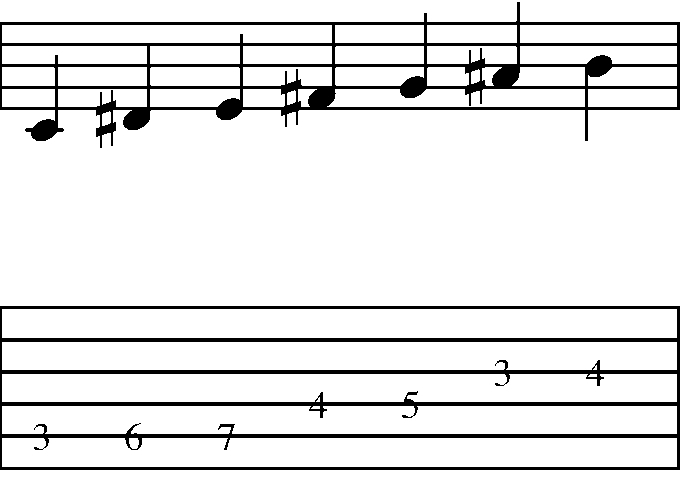 C major chord scale with a # 2, # 4, and a b6 scale degree. Here’s the scale faster (1/4 note at 180). Since we’ve engineered this chord scale around a C major triad – we know that any licks we come up with will work over that chord – but to see what other chords can be used with this scale – we need to harmonize it. Let’s look at the triadic (3 note) harmony first. (Note: even though these don’t have a triadic function they can serve a function enharmonically – I’ll get to that in the 7th chord section). 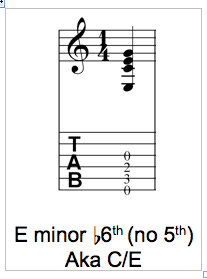 To recap – any licks that we generate from this scale will work over C major, E minor and B major. 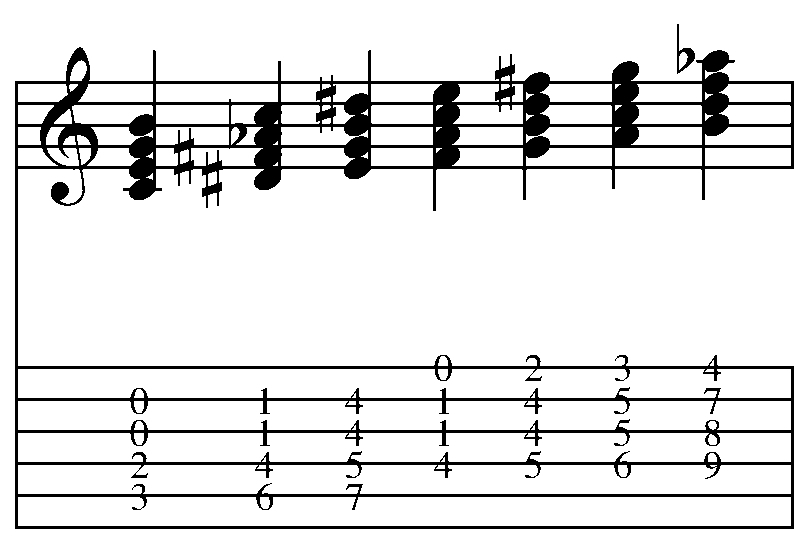 Since we started this approach with C major – let’s look at a lick that spices up a C Major Triad. Here’s an mp3 of the lick. This is an example of something I might play as a backup accompaniment in the pre-chorus of a song. To my ears even playing this over a straight C major tonality, the D#–>E really triggers an E minor tonality. Try playing this over a C major –> E minor progression. 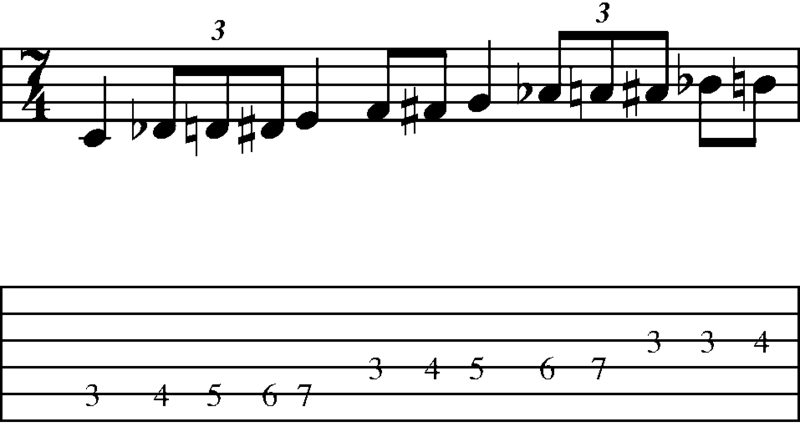 Moving to E minor – here’s an approach I use a lot in rhythm playing. The first step is to take a set of three strings – in this case I’ll use the high E, B and G strings. I’ve started with an initial voicing (Ab, C and E) and moved it through scale-wise motion. (Note: I hear this as G# instead of Ab – you may want to see the section on enharmonics below). Here is an mp3 of the voicings. In the audio example, I play a low E between each chord to establish an overall tonality. Having done this – I see some cool dyads ( 2 note voicings) on the B and G strings that I can use to spice up an E minor vamp. 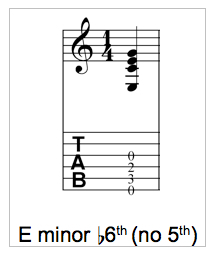 This is an example of the type of comping I might do on the verse of a song if the song chart just said E minor). Here is an mp3 of the lick. Don’t be afraid to lay into the slides or add a little vibrato to make the notes sing a little more. With a lot of these approaches – I’m not really conscious of what the specific functions of the notes are. Once I know that the scale will work over a chord – it’s more about focusing on the sound of the notes and how they fit into the song. On some tunes – these notes would clash with the melody and it wouldn’t work. This process is about building a repertoire of sounds to have at your disposal. Knowing the theory around it just allows you to adapt those sounds and approaches to make the fit where you want them to. Here’s a lick that takes the above approach of breaking chords up into different string sets and applies it to a melody line. Here I’ve focused on the A, D and B strings and added in the high E string at the end. Here is an mp3 of the lick. Note the slides, vibrato and slightly rubato phrasing at the end of the lick. These are the little nuances that help make the difference between playing music and playing notes. This next lick combines chord forms and melody by using artificial (i.e. “harp”) harmonics. To produce these – a chord shape is held with the fretting hand while the picking hand picks and partially frets notes 12 frets higher resulting in a chime like timbre. If you are unfamiliar with this technique – just google Lenny Breau (an absolute master of the approach) and you’ll get an idea. For this specific lick: I’m holding the D# with my second finger, the C with my 3rd and the Ab with my 4th so I can reach the F# with the fret hand 1st finger. 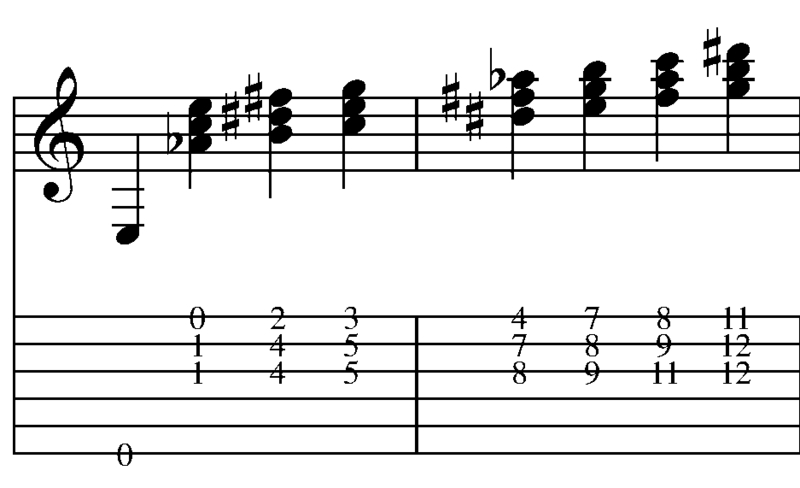 One of the secrets of this method is to strategically time the release of the fret hand notes. The longer you can leave the notes held down, the more the pitches will bleed into one another – which produces the desired effect. Before we go to the next lick I need to make a brief enharmonic diversion. An enharmonic is when a note is spelled differently but sounds the same (for example Ab and G#). When playing this over an E drone – I hear the pitch on the first fret of the G string as a G# (i.e the third of the chord) instead of Ab. It’s very difficult for me to hear that note functioning as a b4. As a case in point, here’s another lick. (This piece makes liberal use of vibrato bar scoops – listening to the mp3 of the lick for phrasing is recommended). 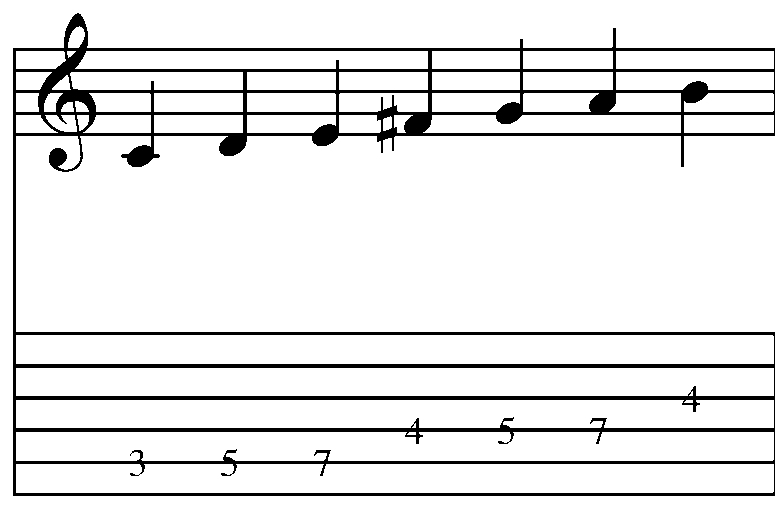 I’ve notated this lick with both a G# and a G natural as those are the intervals I hear in the approach. With this interpretation it makes the scale harmonically vague as it would then have both a major AND a minor 3rd. If we go back over the initial triadic chord and replace the Ab with G#, F# for Gb and D# for Eb we get a couple of different chord options. To recap – in addition to C major, E minor and B major – these licks can also be used with care over E major, Ab major, C minor and G# minor. 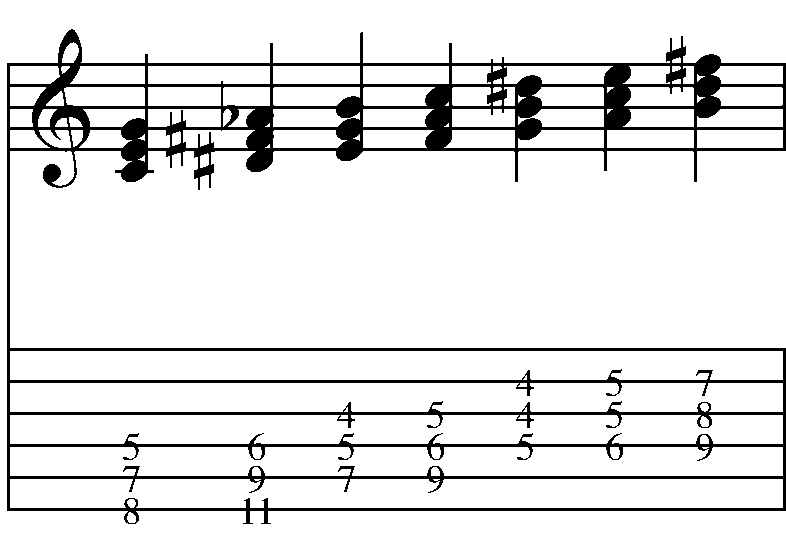 To finish this approach out for now – let’s look at 7th chords. **Note: the stretch on the second chord should be approached with caution. If it hurts – stop playing immediately! D#, F#, Ab, C – Root, 3rd and double flat 5th, double flat 7 – Enharmonically – this spells – Ab, C, Eb, Gb, – or Ab7 – but doesn’t serve a function from the D# pitch. F#, Ab, C, E – Root, double flat 3rd, flat 5th – Enharmonically – this spells – Ab, C, Eb, Gb, – or Ab7 – but doesn’t serve a function from the F# pitch. This gives us a couple of new tonalities to explore – namely, C Major 7th, E minor (major 7th), B7 and Ab7. You will probably not like the use of this scale with all of the chords listed but, as is the case with any musical approach, the key is always to use your ears as a guide to what works and what doesn’t.